The Florida Keys are an amazing place, unlike anywhere else on earth. One of a kind ecosystems, their own species of animals and plants, and a culture all its own. Only around 100,000 people live on this ribbon of 120 miles of coral rock, swamp, salt ponds, and punishingly blue water. You know you are in for an experience once you leave the sprawl of South Dade beyond when Florida City fades in the rear view mirror and the sign looms overhead saying Welcome to the Keys. If you are lucky, traffic moves smoothly and the sun is shining. 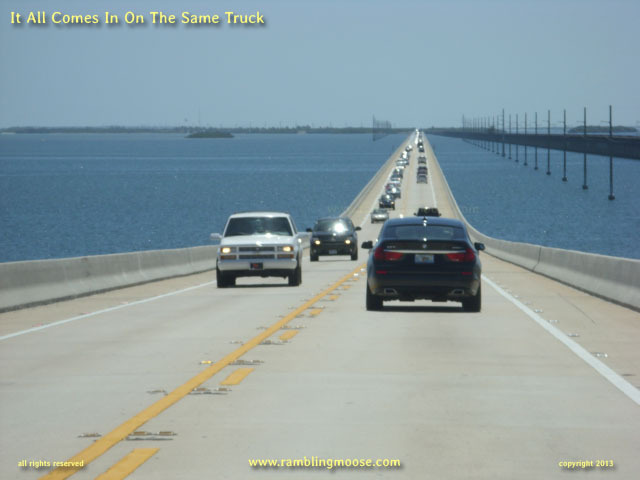 The Seven Mile Bridge is a strip of concrete that separates the Middle Keys from the Lower Keys. A gap between the two groups of footprints in the water that is best seen from a convertible car or a motorcycle, right at sunset, with the breezes flowing past you. But, it does rain in Florida. When it does, that four hour jaunt through a truly amazing landscape of deep azure blue waters and mangrove green becomes a study of license plates, brake lights, and all too common billboards. While they didn't pave paradise to put up a parking lot, they sure did try to put up signs to entice you to buy the latest crap that they can have shipped in from the mainland at inflated prices. Oh sure, you'll stop off because being stuck behind the truck that brings in tomorrow's dinner for what could be a 12 hour journey is an experience that would try anyone's patience. That truck came from Miami right about the same time you did, and you will be following it for the next couple hours. May as well have a grouper sandwich on a dock somewhere. The fish will swim right up to you thinking you have something for them to eat. Like their uncle that was too slow to swim out of the net to become what you have in your hands right now. Uncle Fish morsels fall into the water and into waiting mouths while you wait for Monroe County Sheriff to clear the accident 10 miles down US1 down in Big Pine or Marathon or some other coral rock speckled with life. But at that moment, your reality spins down to an excellent meal, hopefully with an excellent glass of beer or iced tea, in the sun, while you feed a fish its distant cousin. Circle of life. Future Food eating Food that came in on the truck yesterday that just had a fender bender on a scrawny ribbon of concrete and asphalt, 120 miles long, leading from reality to a place called the Florida Keys.